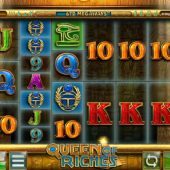 Queen of Riches slot wears the 'MEGAWAYS' crown along with the rest of Big Time Gaming's royal family of games offering the player up to 117,649 ways to win! The others are the infamous Bonanza slot, Dragon Born, Starquest and Danger! High Voltage which are loved and feared in equal measure due to their format and high volatility. 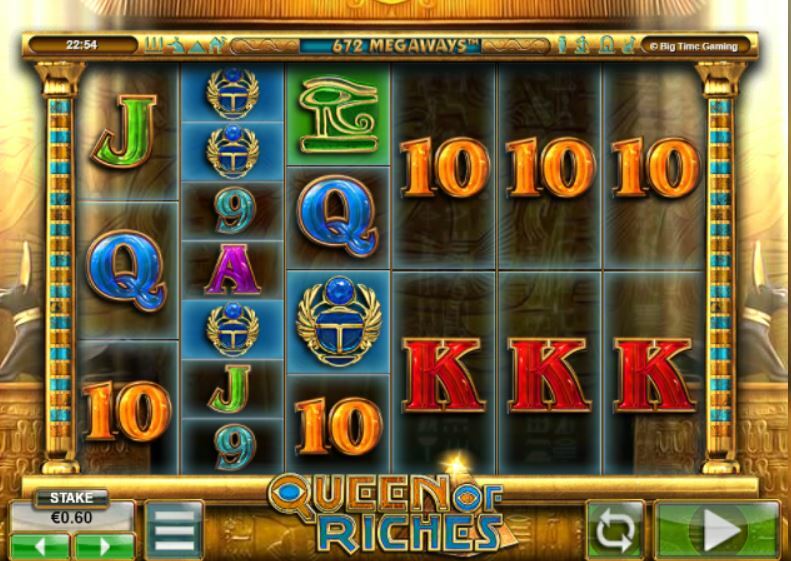 Queen of Riches is no different and we see the reels set in an Egyptian temple with some matching music as they spin and trot to a stop, so will she grant your playing credit a pardon or send it to the gallows? As with all MEGAWAYS games we get 6 reels of varying rows - they will each randomly display a minimum of 2 and maximum of 7, so you can get permutations of between 64 to a maximum of 117649 ways if 7 rows appear on all reels. Symbols can appear single and stacked in various amounts from 2 to 7 rows high. Pyramids pay 30x bet for a full 6-of-a-kind and blue Ra 6x, red Ra 3x and Eye of Horus 1.75 for a full 6. The 6 card values pay 0.5 to 1.5 a bet and the lower the icon's value the more you tend to see them stacked. You do get stacked Wilds on all reels bar the first, but the stack is just for appearances as the actual number of rows they represent is a random number from 1 to 7x and you seldom see values of 3 or more either. This feels a slight swizz as if the Wild gets 1x allocated (which most do) it's equivalent to having a one-symbol reel when the minimum without a Wild is 2! You may see the potentially huge pays that are possible though, as with 6 reels of up to 7 rows it's theoretically possible to get thousands of ways of pays. It's time to mention the main characteristic of the slot now - essentially it's Netent's Twin Spin on steroids and every spin at least 2 reels spin conjoined, and you may get a delay as a third, fourth, fifth or even all six join up. If you get all 6 join and a stack of 3 you would have at 729 ways times a 6-of-a-kind win for example, or 4096 winning full ways with a 4-stack if this occurs. As with all BGT slots, theoretically it can produces simply staggering pays! Queen of Riches slot really is an ultra high-variance version of Twin Spin and like that game has pretty basic sounds and animations but produces a sense of anticipation when those reels start locking together. A high RTP of 96.90% and potential of huge wins may be enough enough to tempt you but before you play remember where this Queen gets her riches from - our bankrolls!